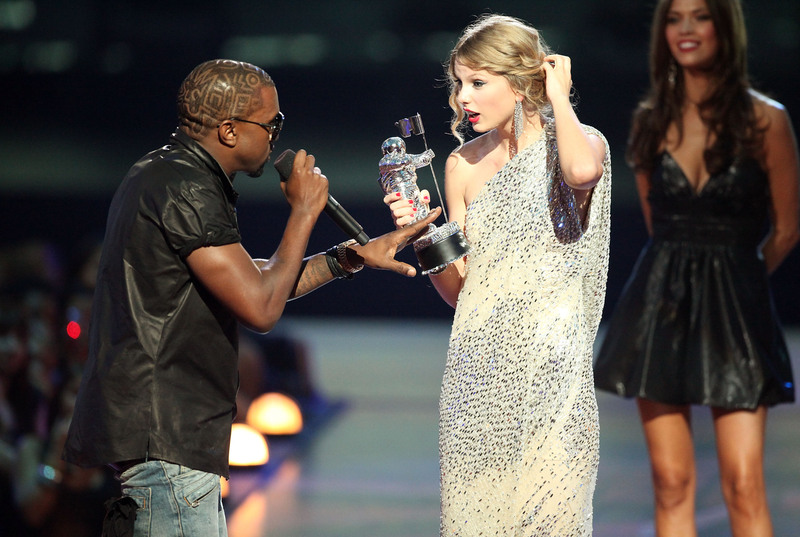 It's officially been five years since Kanye West interrupted Taylor Swift at the VMAs. If that doesn't make you feel old, I don't know what will. It's funny that the event was half a decade ago, but still so relevant in today's pop culture. Maybe it's because Kanye still loves to go on rants today. He did give a 20-minute speech at his wedding, after all. But more likely it's stuck in our memories because it's really quotable. The full rant was, "Yo Taylor, I’m really happy for you, Imma let you finish but Beyonce had one of the best videos of all time…one of the best videos of all time!” But often in pop culture today it's shortened to "Yo, Imma let you finish..." and then it's perfect and reusable for a lot of situations. Even Taylor Swift herself has gotten in on the joke and last year sent some jam to Ed Sheeran with a note that read, "Yo Ed, I’m really happy 4 you and I’m gonna let you finish but this is the best JAM OF ALL TIME — T.” But that's not the only time the phrase has been appropriated. In fact, after the interruption itself the Internet exploded with a number of memes and parodies of Kanye's infamous speech. So in honor of the five year anniversary of Kanye's outburst, here are 12 of the best uses of "Imma let you finish." The tweet is fake, but it's so good I almost wish it was real. Kanye West and Tim Howard? It's the ultimate in Internet jokes. At least Kim knew what she was walking into. Sorry, Kayne. Your rose wall tried. Ah, how the tables have turned. Taylor reaaalllyyyy loves this joke. I don't really know why everyone is an astronaut in this meme, but I appreciate the effort. Remember when Beyonce's new album dropped on T. Swift's birthday? Pretty sure the Illuminati was involved in that joke. On an episode of the hit show Peter steals the mic from Swift to sing a song. No one is safe from Kanye's outbursts. Not even the President.